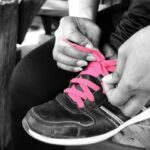 8 Tips to Help You Stick to Your Fitness Goals - Frugal Mom Eh! This is the first year I did not make a New Years resolution, instead I set my fitness goals a few days before Christmas. Every year I make the same resolution and within a couple weeks I’m already over it. Not this time! 2 months in and I am still working towards my fitness goals and sticking to my resolutions. Of course, it hasn’t been easy and there have been bumps along the road but I’ve been available to avoid complete roadblocks and that is certainly something! 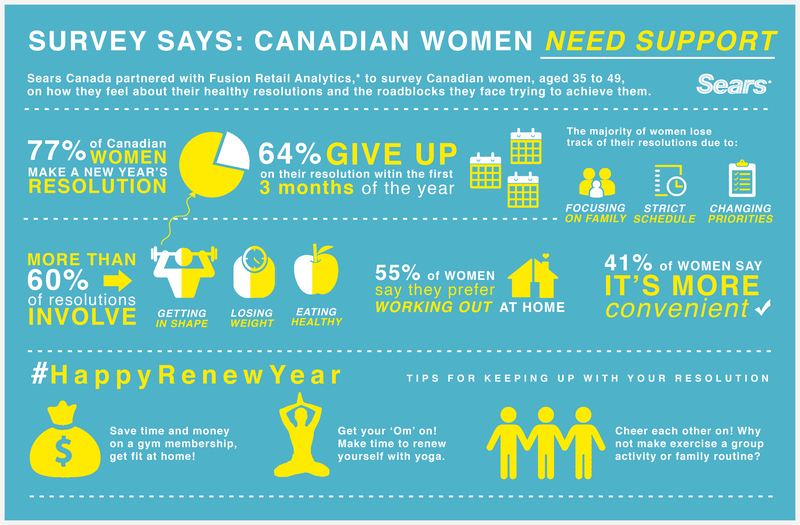 A recent study by Fusion Retail Analytics in partnership with Sears Canada, found that 77 per cent of Canadian women make a New Year’s resolution. Of that 77 percent, more than 60 per cent set resolutions for themselves focused on fitness and wellness goals. Unfortunately 64 per cent say they give up their resolutions within the first three months of the year, mainly due to their hectic schedules. The bumps I have encountered are mostly willpower issues related to food and my preference for sitting down and reading over working out during nap time. When this happens I have to remind myself that pain is temporary but quitting is forever. I think about that every time I give thought to an action or inaction that will lead me astray from my goals. Even if I slip I know I can get right back up and keep going. This is the difference between this time and the last few times I’ve set fitness goals. I have not allowed slip-ups to become more than that. 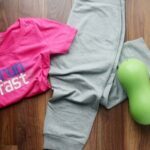 Whether you are just beginning to get into shape, looking for a more intense workout or take on something new, Sears Canada wants to help with its brand new #HappyRenewYear initiative – offering easy, cost-effective solutions and clever hints and tips to help Canadian women achieve their healthy goals. 1. Ditch the snooze button. Wake up 30 minutes early for a quick workout and healthy breakfast at home before starting your work day. This will help you feel accomplished, energized and excited all before 7am! Tip: Walking on a treadmill for 30 minutes every day, burns an extra 1,000 to 1,500 calories a week! I’ve actually been using a mini excercise bike that I use when I am working – I’m using it right now! It helps me get in a little light cardio when I would otherwise just be sitting around. 2. Make staying on track with your goals easy! Celebrate mini-milestones and achievements with a fun, well-deserved treat. Why not reward yourself with fresh, new workout wear like these comfortable and affordable athletic capris and performance tanks? I was on this about 2 weeks after I got started working towards my fitness goals. I took it a bit further though and after picking out some great fitness wear, I also bought myself a half-way point gift to myself. It’s a pair of jeans in a size I haven’t fit in since before I had my 2nd daughter and they are currently sitting at my desk where I get to look at them every single day. It’s motivation and reward all in one! 3. Get moving! Every day activities can be an easy exercise opportunity. Use the commercial breaks in your favourite TV show, or downtime when picking up your kids at hockey, to do some easy workouts on the go, such as leg lifts, bicep curls or marching on the spot. Why not grab a set of kettle bell weights to intensify the exercise? This makes for a time-saving, efficient and effective workout! I use microwave time to do jumping jacks. The girls think it is hilarious and they come running when they hear that microwave so they can join in too! It’s almost Pavlovian now. 4. Save time and money, get fit at home! More than 55 per cent of women surveyed prefer working out at home to spending an average $1,400 per year on a gym membership. At-home fitness equipment and accessories are easily found, purchased and delivered at Sears, often for less than the cost of an annual gym membership. Even if we could afford a gym membership, the introvert in me would rather just stay home. Plus I have no real excuse to skip that workout. 5. Get your “Om” on and make time to renew yourself with yoga! It not only benefits your physical health, it helps reset your mind, increase focus and creativity, and improves sleep. 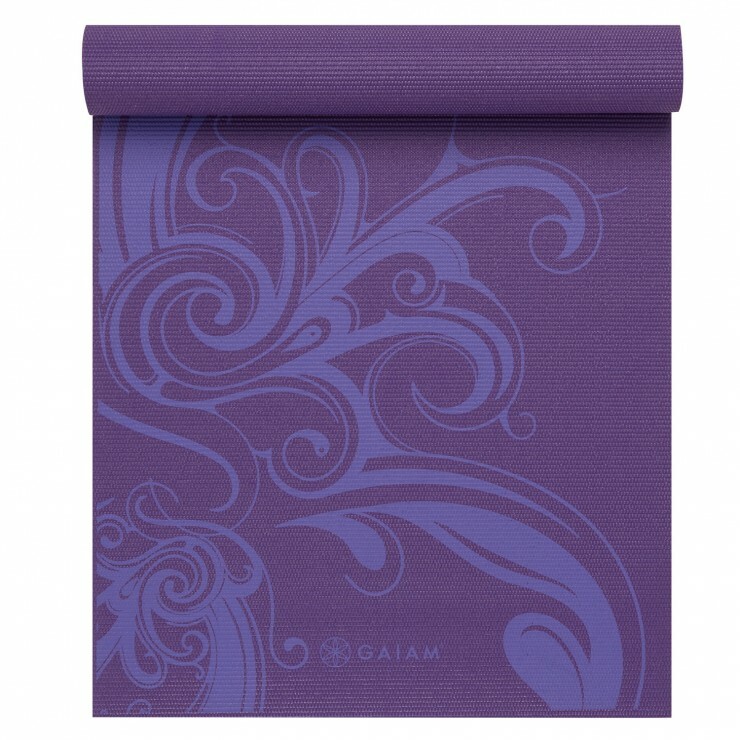 Do your downward dog at home on a gorgeous Gaiam™ Printed Premium Yoga Mat. I never thought I would like yoga. I have to say I’ve been pretty adamant that I would never even attempt yoga. Guys. I tried it. I love it. Yoga day is my favourite day of the week and I’m not even particularly good at it. 6. Make meal planning and prep a part of your weekend To Do list to save time during the workweek! Set yourself up for success and make meal prep easy with the Magic Bullet Blender and the Breville® Juice Fountain™ Duo from Sears Canada. Meal planning (combined with freezer cooking) has been a huge part of what has kept me from failing this time around. I have no excuse to order pizza or eat unhealthy portions as I have it all planned out ahead of time and some of it pre-cooked and ready to eat. 7. Get your friends and family on board! Living a healthier lifestyle is so much easier when you have your loved ones’ support. Why not make working out a group activity, or family routine? Cheer each other on and stage weekly check-ins using a BIOS Glass Electronic Scale to hold each other accountable. I don’t have anyone close to me making a huge lifestyle change so I opted to join a facebook group with other women with similar goals for support. This is a great option for those who don’t have support immediately around them. 8. Change up your workouts to keep things interesting. It’s easy to fall off the wagon when your exercises become boring and routine. Try something new that will target different muscle groups like Pilates in the comfort of your home with the STOTT PILATES SPX™ Reformer Package or channel your inner UFC® athlete with the UFC® Resistance Fitness Kit. I change my workout everyday because boredom is something I really struggle with when it comes to work outs. I find myself looking forward to working out when I change it up, just be sure not to favour the “easier” work outs. I love workouts that involve weights but cannot stand cardio workouts. Still I force myself to to do them and get through them and slowly but surely they are getting a little easier to do. Visit Sears Canada online or in-store at a locati0n near you to shop for everything from workout wear and accessories to restorative equipment, treadmills and home gyms, by Canada’s favourite brands including NordicTrack and Bowflex. Connect with Sears Canada on Facebook, Twitter, and Instagram. Don’t forget to join the conversation with the hashtag #HappyRenewYear! Disclosure: This post has been sponsored by Sears Canada. All thoughts and opinions are honest and my own. Elizabeth, Hi! I’m always looking for ways to maintain my health and fitness goals – so thank you for this post. Also, could you tell me what social media buttons you’re using on the side here? I need some new ones for my site and I like the look of yours! Thanks! These are all great tips. I need to focus on getting some exercise in during my day. These are some great tips. I know how hard it can be to make sure to keep on track with exercising. I’ve had my times where I quit exercising, so it is hard to keep at it, but when you find something you love it’s not so hard anymore. 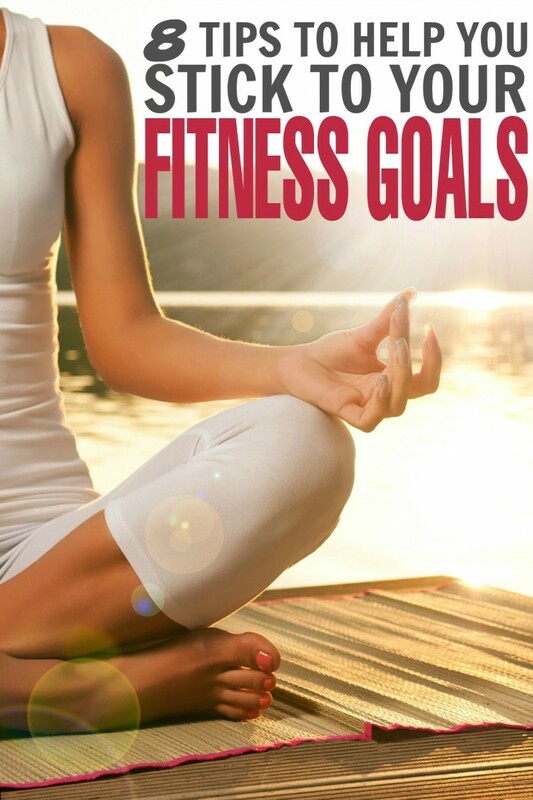 These are great tips for reaching your fitness goals. I bought a fitness tracker to help me keep track and motivate me. Meal planning is a great way to save money on food. These are such great tips! I need all the help I can can get sticking to my fitness goals! Ask great tips! I love the idea of meal planning to not just saver money but also to stick to weight loss goals. These are awesome tips! I need to get up earlier and workout… which means I need to go to bed earlier. Not sure when I am supposed to work! 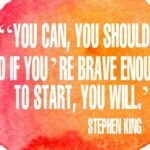 Embarking on a fitness journey can be so intimidating! It really takes some perseverance! These are great tips to help someone reach their fitness goals. I hope they hep others be successful in their mission to get fit! Since November 1st, my family has committed to working out daily. We head to the gym daily after dinner to exercise. I’m the worst with my snooze button. I have got to stop using that thing! Also, meal planning is something I really need to get better at.